The awards were well received and were very tastefully executed and most appropriate for the event. Many thanks for your help. Product Description: This optical crystal book award has a smooth face which is perfect to engrave your text and/or logo onto. 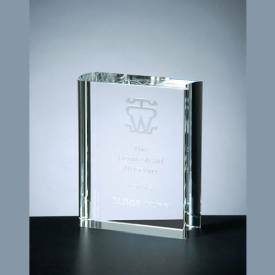 This crystal book award is a great award to present to that someone special. Packaging: Foam lined gift box. Pricing Notes: Text and/or logo engraving is included in the price. Production Time: Please allow 5-7 business days, from customer approved award proofs, for orders under 6 awards. Additional time required for larger orders.